I felt a little down one night, so I went to see my friend after work. She soon sorted me out - she got out the felt and got me working my arm muscles! She had bought me a notebook so I can do some journalling and had intended to make me a cover, but decided I could do it myself. The above arrangement is the wool and tops laid out in my chosen "design". I went for really bright colours because I love them! Then there was rubbing with hot water and soap, more rubbing, turning, rubbing, turning rubbing, then rolling, rolling, rolling, rolling.... When I got home I soaked it in a little vinegar to get rid of the soap and laid it out to dry. It is still laying out to dry. It IS dry, it's been dry for ages... I just haven't had the time to make it into a book cover yet! Felting is so good for stress release, and I'm sure it must count as exercise? Very pretty! I cant wait to see how you cover your new journal with it. I think it is partly just all the physical effort, of an unusual sort. A change is as good as a rest..! Felt should be good for exercise as it is such a physical process and by rights, I should have lovely toned upper arms by now, but sadly, they have yet to show themselves! 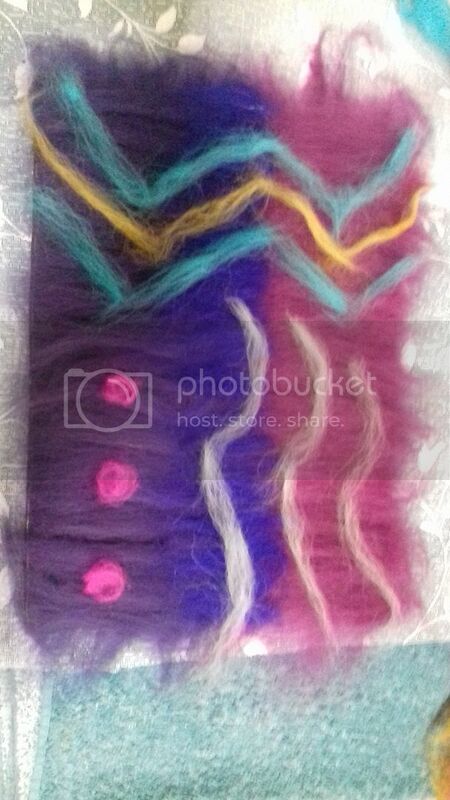 Your felt will make a lovely journal cover. 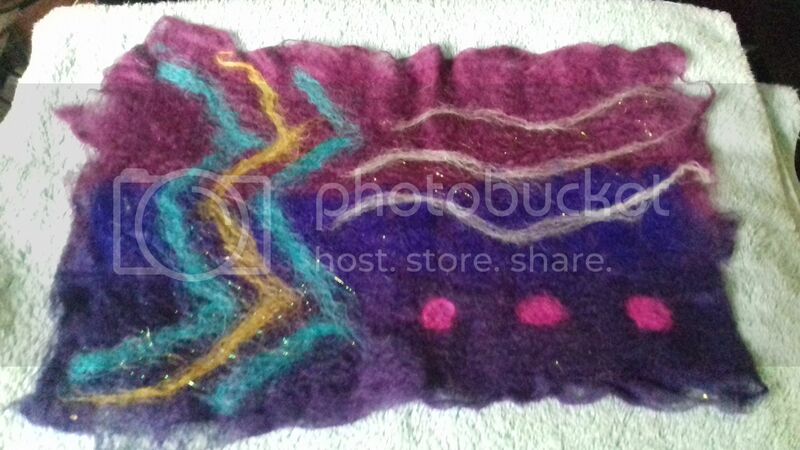 Ive never done that felting but have watched ... it's a lot of work..... righto, is that journal cover almost done???? Gorgeous and definitely a workout!